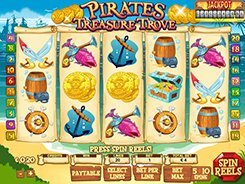 This is a high-limit slot that has a pirate theme and is designed in a funny cartoonish manner. The symbols in the game relate to the theme and depict an anchor, pirate swords, a mermaid, a winking crocodile, and other related icons. A player has three adjustable bet settings, namely, a coin size ($0.1 to $10), the number of coins per line (up to 10), and the number of paylines to wager on (1 to 20). Thus, the minimum and maximum stakes are $2 and $2000 with all lines activated. Allowing high rollers to bet big, Pirates Treasure Trove offers truly massive winning payouts. The three biggest prizes that can be won in the game are: $500,000 for a combination of five wild symbols; $100,000 for hitting five Ladies across a payline and; $50,000 for getting four wild symbols lined up. Besides, the slot has a Treasure Chest symbol, with these three starting the Treasure Bonus mini-game that may award up to 7000 coins or $700,000! You can also benefit from a set of 5, 10 or 20 free spins that are granted for hitting 3+ scatters in view. PLAY FOR REAL MONEY!